The Schaeffer Family settled and began farming in Fleetwood in the early 1800s. Lee is the 9th generation to farm some of this very same land today! If you’re interested in learning about the family lineage, just ask Lee or his dad, Barry. Then, pull up a seat (like a 5-gallon bucket turned upside-down) and get ready for a story or three! Today, the Gauker Family farms about 260 acres of corn, soybeans, wheat, and hay. Today we have about 50 head of Holstein steers ranging from just a few days old to finished. 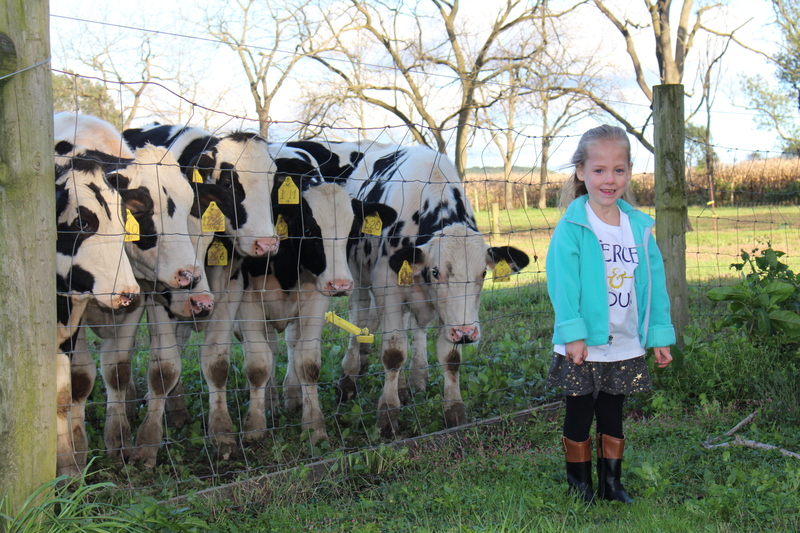 Lee and Jodi welcomed the 10th generation to Gauker Farms on October 27, 2014 – Callie Anne. Together, the family works hard to raise quality beef for your family table! Read more about us through this interview with the PA Beef Council! To read more about our farm and how we raise our crops and steers, check out our frequently asked question section of our website. We are proud members of Buy Fresh Buy Local Greater Lehigh Valley and Berks Southeast Cattlemen’s Association.. Jodi and Lee are former 4-H volunteers (taking some time off now until Callie is a member! 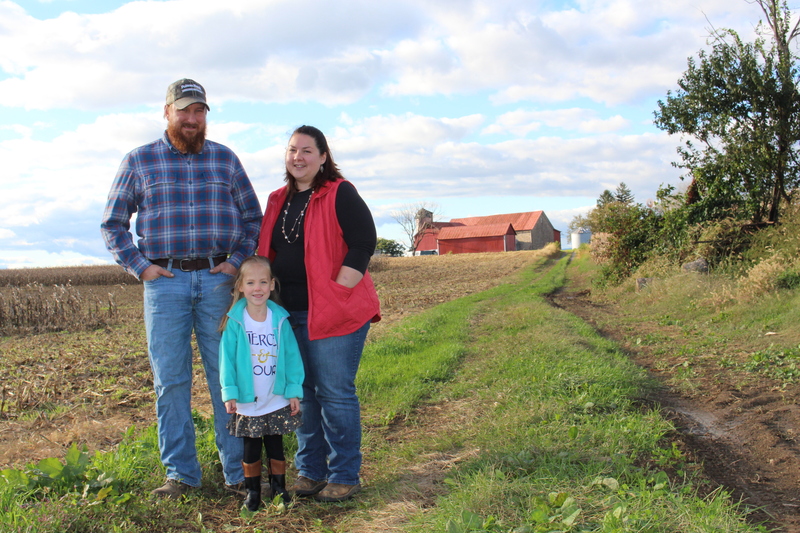 ), and Jodi currently serves as Secretary of the Berks County Planning Commission Board, serves on the Chester County Agricultural Development Council Board, and is a member of the PA Women’s Agricultural Network. Hi, Jim! We will be at Artisan Exchange from 10-2 this Saturday. Hope to see you there! If you’d like to preorder you can always email at gaukerfarms@gmail.com. Your farm looks beautiful! I would like to hear about your family’s lineage. If you have anything you could or were willing to share, I’d be interested in seeing it. Thanks! Hi, Jane! Gauker Farms became Gauker Farms in the last 100 years. The Farm is actually the Schaeffer Farm. Lee’s great grandmother married a Gauker. He passed on after having a son, Lee, and Laura Schaeffer remarried a Heffner. Lee Gauker, (my husband, Lee’s, grandfather) is the first Gauker to manage the farm. Beyond that, though, I’m not sure that we’re familiar with the Gauker family lineage. The Schaeffer Family, however, is well documented. Just noticed your reply. Thanks for responding! I’m not sure of more than 4 or 5 generations back of my dad’s family in Indiana, but I was born In MN. Best wishes… Jane G.
Thank you so much, Christine, for your kind words! We are at the Downingtown Farmers Market every Saturday during their regular season, and during their winter market (we think that will be the 2nd and 4th Saturdays from 10-noon in the parking lot of Kerr Park). Thank you again! I am very interested, as a Schaeffer, to know if the family line hoes back to Sunnyside Dairy, E.G. Schaeffer, Houck Road off 662. My father was raised there until they relocated to Oley. To our knowledge, no. George Schaeffer was the 1st generation, followed by Phillip. Laura, an only child, was the 6th generation who married John Gauker. She remarried to Howard Heffner after having her son, Lee Gauker. Lee Gauker had 5 children and the oldest son, Barry, carried on the farm. His son, Lee, and his wife, Jodi (that’s me), operate the farm today. We do have a copy of the Schaeffer family history and will look it up. We do have hay but only in large square bales, not small bales that you’d be able to take home in a car.